All recipes and images from Marian Morash's The Victory Garden Cookbook, 1982. Marian Morash became a household name (at least to PBS viewers) as “Chef Marian” on The Victory Garden in the 1980s. As detailed in our podcast interview with her and her husband, The Victory Garden’s creator and producer Russell Morash, Marian started supplying vegetable recipes to be read by the host on the first incarnation of the show, Crockett’s Victory Garden, around 1978 when viewers wrote in asking what to cook with all of the unusual vegetables that show was introducing to them. By 1980 the garden had moved to her own garden and she was shown onscreen at the end of each episode, preparing and cooking whatever had been harvested that day. Marian’s enthusiasm and prowess with vegetables were obvious. As she relays in the interview, her original teacher and sometime collaborator Julia Child (Marian was executive chef on several series that Child filmed in the 1970s and 1980s) was not a fan of vegetables—luckily Marian has always been as enthusiastic about cooking them as Russell has been about growing them. In 1982 she published The Victory Garden Cookbook, a monolithic compendium of over 800 vegetable recipes that was truly the first of its type to be written. Not vegetarian, Marian celebrates preparing and cooking vegetables in every possible way: raw salads to meat stews to pasta sauces to many desserts. Arranged alphabetically by vegetable (all ones commonly grown by home gardeners), Marian describes everything from how to choose at the market and how to store. While definitely a celebration of joys of fresh vegetables, the recipes can seem quite heavy on the butter and cream—something Marian has admitted she would change to olive oil if she reworked the book today, yet even in 1982 she explained her decision thus: “We reckon we can enjoy delicious steamed, blanched, or bouillon-braised vegetables six nights of the week and splurge on a buttery concoction on the seventh.” It’s easy to make substitutions for most dishes, and among the 800 there are many that are so fresh and healthy they are perfectly in keeping with “clean-eating” style of the moment. As difficult as it is to choose a few recipes from over eight hundred, below are a few delicious ones for you to try. As the radish dip was mentioned by Russell in the interview it definitely deserved a place in this feature, alongside an unusual starter/side dish of broth-braised lettuce and stuffed fennel (which can be paired with capon for a non-vegetarian meal). It’s amazing that a vegetable that looks as light and airy as lettuce takes so long to braise. But the slow cooking produces an enticing liaison of vegetables and broth. I like escarole best, although you can use Boston or Bibb lettuce or chicory. Drop bacon into boiling water and simmer for 10 minutes. Drain, dry, chop, and set aside. Trim the lettuce base, and remove core and outer bruised or damaged leaves. Careful cleaning is absolutely necessary here! Gritty braised lettuce is a disaster. I part the leaves to let water run down among them, then fill the sink with warm water and soak the lettuces head down before plunging them up and down until they are clean. Boil a large pot of water, plunge the lettuces in it, two at a time, let the water come to a boil, and cook the lettuces 2 minutes. Then place in a sink of cold water to cool down. (This is just to wilt them.) Drain. 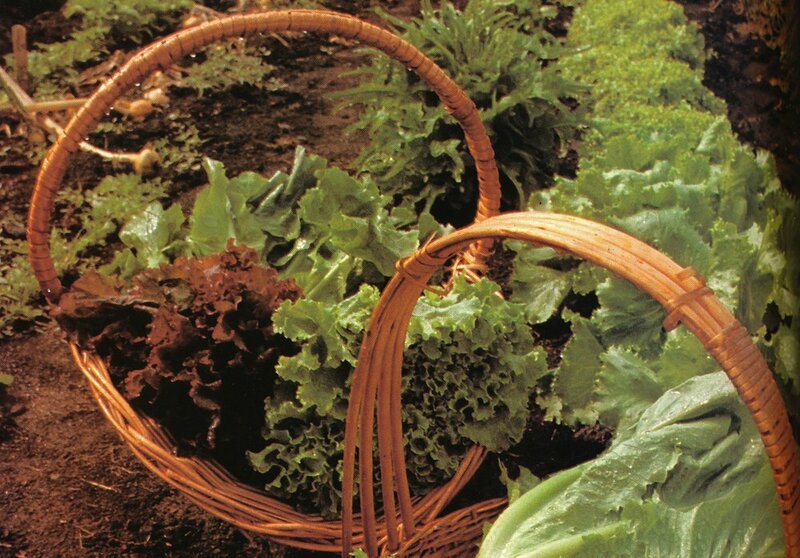 Halve lettuces lengthwise (or, if heads are small, leave them whole) and gently squeeze out the excess moisture. Fold the cut side in half on itself and set aside. Chop the onion and carrot, and sauté in 2 tablespoons of butter for 5 minutes. If you have a bumper radish crop, don’t despair. Serve it with crackers or raw vegetable crudités. These fennel boats are particularly nice cooked with a braised bird, especially a succulent capon. Stuffing the capon’s cavity with the fennel trimmings flavors the flesh with a delicate perfume. These boats can be cooked, however, just as they are for a satisfying vegetarian dish. Wash and trim fennel bulbs, leaving 1/8 inch of the root base to hold the bulb together. Each bulb should weigh approximately 12 ounces. Chop ¼ cup of the leaves and combine with parsley; set aside. Save remaining trimmings, stalks, and leaves if you braising the capon below. Blanch the fennel bulbs in salted water until barely tender, 8-10 minutes. Remove, cool, and then halve lengthwise, and remove the small center layers. Finely chop these fennel layers and set aside. Cut away most of the core, leaving just enough to retain shape. You will end up with 6 fennel halves to stuff. Peel the eggplant and dice into 1/4 –inch pieces. Salt and let drain in a colander for 20 minutes. Peel, seed, and chop tomatoes. If they are pale and out of season, use half fresh and half canned peeled and drained tomatoes. Chop onion and garlic. Dry the eggplant, sauté in oil to lightly brown. Add onion and garlic and cook with eggplant for 2-3 minutes. Add tomatoes, cover pan, and cook for 10 minutes to soften eggplant and release tomato juices. Remove cover and cook 10 minutes longer, or until juices are evaporated. Stir in the reserved chopped fennel and half of the reserved parsley-fennel mixture; season with salt and pepper to taste. Remove the vegetables and boil down remaining juices to form a glaze. Pour it over the vegetable mixture. Stuff the fennel boats with vegetable mixture, mounding it up in each boat. (Reserve any extra stuffing for Braised Capon with Fennel Boats.) Place the boats in an oven-proof dish, add chicken stock, cover, and bake in a pre-heated 350° oven for 30 minutes. Or braise alsongside capon, duck, turkey, etc., during the last 30 minutes of cooking. Before serving, garnish each stuffed boat with a sprinkling of the remaining parsley-fennel mixture. Chop enough fennel trimmings and leaves to make 4 cups. Chop onions. Cook chopped fennel and half the onions in 4 tablespoons of butter until wilted, about 10 minutes. Set aside to cool. Chop carrot and combine with remaining onion. Remove fat from cavity of capon, wash and dry capon. Salt and pepper the inside and stuff with fennel and onion mixture. Truss. Brown capon slowly for 10 minutes in 4 tablespoons butter and oil in a large ovenproof casserole, watching to see that butter does not burn. Cover and put into a 400° oven for 10 minutes to render fat. Remove, pour off fat, and reduce oven temperature to 350°. Set casserole on burner, add chopped onions and carrots, vermouth and stock and any leftover vegetable mixture from Stuffed Fennel Boats. Bring to simmer. Cover and cook in oven for 1½ hours or until juices run clear yellow. Thirty minutes before the capon is done, surround with the stuffed fennel halves. When the capon is cooked, remove from the casserole and keep warm along with the fennel boats. Degrease the pan juices and mash any vegetables in the juice to a pulp. Boil to thicken, if necessary. Carve the capon and serve with fennel boats. Sauce with thickened pan juices.